The first thing you need to know about deviled eggs is that when you bring them to a party, everyone will coo over how “retro” or “Junior League” they are. Then they will eat them all, quickly. A little research reveals that the “retro” label is accurate, but in reference to a time period a bit further back than the mid-20th century cocktail nibble you might imagine. People have been taking the innards out of eggs and stuffing them back in since ancient Roman times. I guess nothing says “party” like a fancy, hard-cooked egg. This makes sense, I suppose. 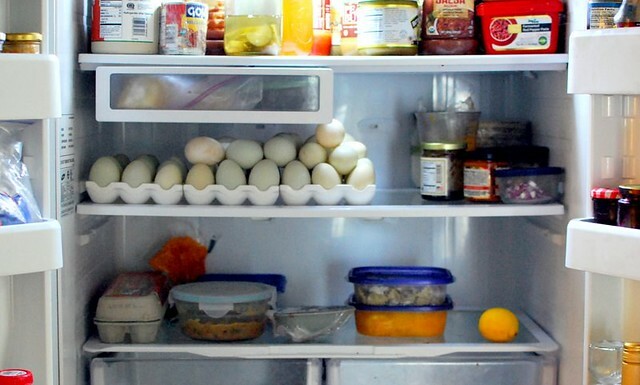 A plain hard-boiled egg, while delicious, is definitely a snack or meal for one. Portable, serviceable, and a bit too sulfurous to be festive, they are not glamorous. We peel plain hard-boiled eggs for ourselves, not worrying about presentation (you’re likely smashing it up or chopping it for salad). En masse, hard boiled eggs are the stuff of continental breakfast buffets. But the deviled egg, on the other hand! A platter of deviled eggs is for sharing, and making it takes a little time and care. I feel strongly about deviled eggs because I make them a lot. Any household with an abundance of fresh eggs, as I am lucky enough to live in, needs an arsenal of recipes in which to use them up. In deviled eggs, I have perennially available appetizer: eggs plus the mayonnaise and mustard that are nearly always on hand. Deviled eggs are made out of pedestrian ingredients. Making good deviled eggs, however, is all about technique. First, you must boil the eggs. If underboiled, your egg yolks will be too custardy or goopy for smashing into a deviled filling; if overboiled, the sphere of hardcooked yolk will be surrounded by an unappealing, smudgy, grey-green halo, and the brimstone odor will be amplified. The Internet abounds with ways for cooking eggs to the right consistency and color. I find that methods calling for first bringing water to a full boil and then adding the eggs are imprecise and difficult to get right, especially when using ungraded eggs (in other words: eggs of varying sizes) from farms and backyards. Instead, I prefer the egg boiling method first brought to my attention by Molly Wizenberg: place eggs in a pot of water covered by about an inch of water. Bring the water to a rolling boil. Then, remove the pot from the heat, clap a lid on the top, and allow the eggs to continue cooking in the hot water. 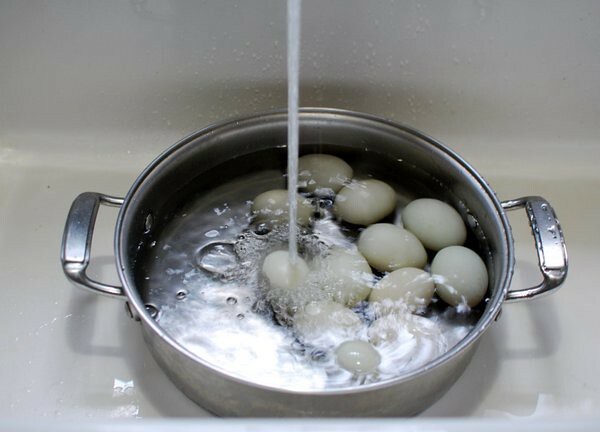 After 12 minutes, transfer the eggs to an ice water bath to halt their cooking. This produces the perfect egg for deviling: hard-cooked through but not overcooked, with a firm yolk that smashes down densely and not-too-crumbly. But before we get into smashing yolks, we have to talk about peeling the eggs once boiled. Peeling hardboiled eggs easily, and, in the case of deviled eggs, keeping them relatively nice-looking for presentation, is surprisingly consternating. If I were more Harold McGee– or Kenji Lopez-Alt-ish—and I’m not—there’s something to be said here about the relative alkalinity of an egg, the way its pH gets higher as it sits in the fridge, as well as about the porousness of the eggshell and the air that intrudes over time as it sits on the shelf. But this is not the Food Lab! I will leave you with the three things that, in practice, make the most difference to me when I peel eggs. First: do not use the freshest eggs. Elizabeth David once wrote “few people will quarrel with the rule that an egg more than three days old had better be cooked some other way” than boiled. Elizabeth David was smart about many things, but had perhaps had too many glasses of wine with her omelette when she wrote that one. The exact opposite is true. I experience much better ease of peeling with supermarket eggs than with the fresh eggs from our home, which I attribute (again, unscientifically) to the fact that they have typically been in transit and on the shelf for much longer than the eggs from our own hens. If I plan to make deviled eggs, I’ll try to choose those that have been in the refrigerator the longest. Second, transfer the eggs to an ice bath and let them sit there for awhile. I suspect this has something to do with the aforementioned porousness of the eggshell. Peeling hardboiled eggs after they’ve sat in cold water for awhile makes them release much more easily from their shell. Third, remember that no one really cares if your eggs aren’t perfectly peeled. They will get eaten anyway, and they will look just fine. Which brings us to the important part: the filling. While people will try to convince you that there is a “classic” way to make a deviled egg, I don’t believe there is. First of all, “classic” implies some definite point of origin, and we’ve already established that people have enjoyed dissembling and reassembling their hardcooked yolks and their hardcooked whites for a long time. Secondly, if your “classic” deviled egg refers to, let’s say, a post World War-II, slightly charmingly Southern or Midwestern United States version of a deviled egg, there are still infinite variations. Most agree about the basics: hardboiled egg yolks, mayonnaise, mustard, salt, pepper (black or white pepper, though, is up for debate), perhaps a shake of cayenne. Some insist on paprika (I don’t). Virginia Willis, who I trust, puts softened unsalted butter in her egg filling (I have tried this and it is very nice, but I haven’t done a side by side comparison to figure out if it truly is genius). Michael Ruhlman, who literally wrote the book on eggs, thinks that you should include lemon juice and shallots in a basic deviled egg. Ian Knauer, who literally wrote the other book on eggs, includes chopped capers in his classic deviled egg (I very much like capers but they’re beyond-basic for me). When I was growing up, one of the first things I learned to make in the kitchen was “the devil”, as I called the deviled egg filling. My mom’s deviled egg filling started by first fork-smashing the yolks into a crumbly, even consistency, mixing with mayonnaise and Dijon to taste, and then using the same fork and a clean finger to dollop the dense filling into the waiting egg halves. I like the look of these non-piped-filling deviled eggs, and it avoids the fussiness of piping, but the fork crumble method sometimes leads to lumpy filling. 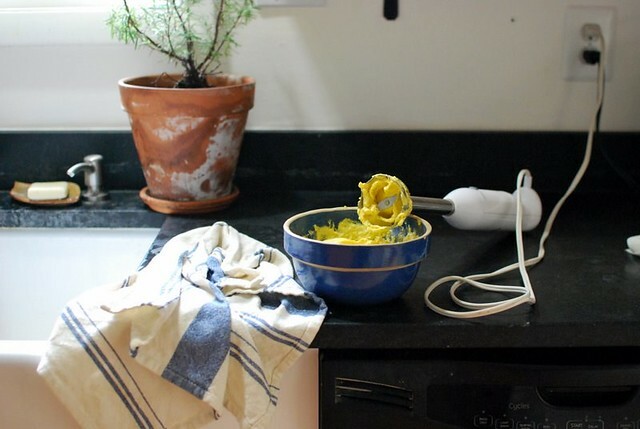 To avoid this, some methods call for passing the yolks through a mesh sieve (works, is kind of a pain to clean up), others for food processing (also works, also is kind of a pain to clean up), but lately I’ve been using my favorite kitchen appliance: the stick blender. I roughly smash the yolks in a bowl, add mayo and mustard and seasoning, and pulse. I aim for creamy but dense filling. Deviled eggs that are very fluffy or whipped feel unbalanced, the yolks not standing up enough to the firm whites. 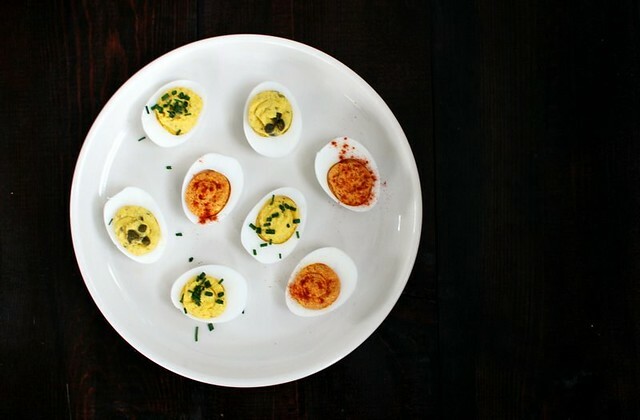 If you don’t care about achieving a classic deviled egg, then the fun begins. Harissa and pimentón make for a spicy, smoky, slightly funky deviled egg that turns the filling a pretty salmon-y, orange color. Chopped caramelized onions make a sweet-and-savory, rich crowd pleaser of a deviled egg. Lately, I prefer some tang in my deviled egg filling, replacing half the mayonnaise with sour cream, crème fraiche, or Greek yogurt. Almost all platters of deviled eggs benefit from fistfuls of chopped soft green herbs scattered over the top. Chives or parsley are easy winners, tarragon or chervil are nice if they don’t overwhelm, and cilantro is good if it fits (kimchi deviled eggs! Cumin deviled eggs!) I don’t like bacon on deviled eggs, but other people seem to enjoy a crisp piece of it on top, so go for it. This time of year, a very nice deviled egg might have some chopped blanched asparagus on top. At our wedding almost a year ago, we served deviled eggs during cocktail hour. I arrived late and, lamentably, did not even get to eat one, and nursed my glass of rosé sans salty snack. This, above all, is the most important piece of advice I can give when you make deviled eggs: make sure to save some for yourself. First, boil your eggs. In a pot that fits the eggs rather snugly, cover the eggs with one inch of water. Over high heat, bring the eggs to a boil. When the water reaches a full rolling boil, with very large bubbles breaking the surface several times a second, remove the pot from the heat, clap a lid on it, and set a timer for twelve minutes. Prepare an ice bath in a large bowl with cold water and ice. When the timer goes off, immediately drain the eggs or scoop from the hot water with a spider skimmer, and add the eggs to the ice water bath. At minimum, allow the eggs to cool enough to be handled, but it’s better to let them sit in the ice bath for an hour or so, which in my experience makes them easier to peel. To peel the eggs, tap them gently on the countertop, allowing the weight of the egg to crack the shell’s surface without damaging the egg itself underneath. Some people gently roll the egg across a hard surface, or you can drop it a few times from a few inches height. Be sure to tap the egg on both ends—there will be an air pocket at one end. The shell will crumple around this air pocket, allowing you easy access to peeling the shell from the egg. Get the shells of as best you can. Some people prefer to do this under running cool water. Once you have peeled all the eggs, slice them in half lengthwise. (You can also slice them in half across their middles, creating halved eggs that are rounder and smaller in diameter, but then you’ll need to slice a little bit off the bottom to allow the egg half to sit flat.) Gently prod and release the hard boiled egg yolks into a bowl. Set the whites, which are now empty egg white shells, aside on a plate lined with a paper towel. Smash the egg yolks up with a fork until they are of a reasonably uniform, crumbled consistency. Add the mayonnaise, mustard, a pinch of salt, a pinch of pepper, and a dash cayenne (if desired). Mix together with the fork, or, alternatively, pulse the mixture several times with a stick/immersion blender until creamy. Taste for seasoning: it will likely need more salt and pepper. Season accordingly, until it’s the way you want it. TO MAKE AHEAD: Stop here. Put plastic wrap over the egg white halves on their paper towel lined plate. Transfer egg yolk filling mixture to a plastic zipper bag, and store in the refrigerator. To assemble: Arrange the egg white halves on a platter. Using a fork and a clean finger, dollop the egg yolk filling mixture into the waiting egg white halves, evenly distributing the mixture among the egg whites. If you’d like to pipe the filling, use a rubber spatula to scoop the egg yolk mixture into the corner of a gallon freezer bag. Snip the corner off, and squeeze the bag to pipe the filling into the eggs. Garnish the eggs with chopped green herbs, and serve. For Virginia Willis’s luxurious butter deviled eggs: Add softened butter to the egg yolk filling before mixing. For smoky harissa eggs: Omit the pinch salt and optional cayenne when assembling egg yolk mixture ingredients in bowl, then add harissa paste and several dashes pimenton to the egg yolk filling before mixing. For caramelized onion deviled eggs: Omit the pinch salt and optional cayenne when assembling egg yolk mixture ingredients in bowl. After mixing, stir finely chopped caramelized onions through the mixture. Taste for seasoning, and season to taste with salt and pepper. Ah, an ode to the deviled egg! One of my favorite items ever. We make them like you do , with a little dill pickle and pickle juice added in. But I like the variations you’ve noted esp. The capers , the shallots. Excellent piece. 1000+ words spent well! Off to boil some eggs. Yes, yes yes. They are one of those things that seems so simple and yet every time you eat them it’s a revelation – they’re fantastic! I love how thorough this was – definitely going to be my point of reference next time I make some. I have hens too, and sometimes the eggs I have on hand are just too fresh to peel easily when hard boiled. The solution . . . . steam the eggs! Just put them in a regular vegetable steamer, then steam for 18-20 minutes. They’ll peel beautifully. I’m all for having deviled eggs at a party as I don’t know of a time when they weren’t the first plate to be left empty. I can’t wait to try your variations. I started canning sweet pickle relish a few summers back and now it is my favorite addition to deviled egg filling. So good with the mayo and mustard and paprika on top. If I’m not feeling fancy, or want something to eat on toast, I just mash everything together into egg salad. If you haven’t tried steaming your ‘boiled’ eggs, maybe give it just one go. I find it to be the single answer to hard to peel eggs. Like searing meat to keep it from sticking, having the egg go very quickly from cold to hot makes all the difference in getting it to pull away from the shell. Of course you could drop cold eggs into a pan of boiling water, but we all know what happens than, hence warming them up slowly with the water. Settling the eggs into a steamer basket over already boiling water, however, is easy and fast. I do between nine and ten minutes on the timer (depending on the size of the eggs) from when I set them in there so that I can have one egg with a softish yolk right away (smashed in a bowl with butter) and then the rest sit on a towel for a minute so I don’t have to burn my hands and the yolks firm right up. Run them under cool water and peel. We all have our ways, and Molly’s are often really really good ways. But this works so well for me. Deviled eggs are one of my favorite snacks, and I try to keep some in the fridge whenever possible. Personally never been a fan of mayo in the filling, and a friend taught me her trick: greek yoghurt and olive oil. Very, very good. My favorite seasoning combos: garam masala (I’m Indian!) + cilantro leaves, or, cajun spices + tabasco with deep fried onion (from the Asian grocery, though French’s probably works well, too!). Yum! PS: I’ve been using a pressure cooker to prep my eggs for a while and it works GREAT. Also, have you ever had a Chinese-style soy sauce egg?? Whole boiled eggs (peeled or unpeeled) soaked overnight in a solution made of soy sauce, brown sugar and Chinese 5-spice powder…Tasty! Hard boiled egg yolk, mayonnaise and PESTO! My favorite deviled egg filling is made with just avocado, lemon juice, and salt. I call them Green Eggs and my kids eat them up. That is, if I don’t eat them up first! To fancy up deviled eggs a bit, add some room temp boursin cheese to the “devil”. Super easy and tasty! I agree that deviled eggs are the first thing to go at parties and I have definitely missed getting one. My German relatives call them “Russian eggs” and my MIL has her own twist which uses olive oil instead of mayonnaise, also very good. Thanks for all the tips, I’ll have to try the sprinkling of something besides chives! I like to use local eggs which tend to be very fresh unless you buy them ahead of time and set them aside. But the freshest eggs, I’ve found, really can’t be peeled properly at all if started in cold water. It’s not a matter of them being not pretty; half the white ends up stuck to the eggshell. My last batch I started in hot water, for 10 minutes (they were all the same size) and used an ice bath as you’ve suggested, and the peel fell right off. Experiments are helpful… I tried to find the site where I got the hot-start vs. cold-start tip, and instead I found this string of very detailed experiments. Also confirming the hot start as the ultimate factor in peel-ability. I am obsessed with deviled eggs. I make them at least twice a month. I’ve loved them my whole life. Everywhere I have worked, I bring in deviled eggs and people think I’m crazy. At two different jobs now I’ve gotten at least one other person to make them and bring them in too so we can indulge in lots of different deviled eggs (at one job I started a deviled eggs contest…)! Every party I go to I bring them (and they are always eaten, just like you say). I follow the exact same method for hard-boiling. Cooling in ice water is key. I actually enjoy peeling eggs (again, people think I’m nuts). I never measure what I put in the filling but its pretty much what you say (mayo, mustard, salt & pep, onion & garlic powder [I don’t even know if it really adds anything but I add it], a tiny bit pickle juice(! ), maybe lemon juice, hot sauce, etc). Sometimes I’ll add cream cheese and then some smoked salmon on top. I love chopped chives on top too. Usually I keep it simple. They are sooo good. They make me happy. I’m so glad they also make you happy. I love deviled eggs – if you’re feeling really really fancy, they benefit from a nice little spoonful of caviar. Egg on egg! Who would have thought? So I’m not even sure anymore how I got to your blog this afternoon, but it turned out that I ended up lingering much longer than anticipated, pulled in by your writing. This is my favorite post thus far. Deviled eggs have long been a bone of contention in my family. I listened to the debates at family gatherings and the smug smiles on the faces of those whose deviled eggs were consumed faster than their competitors, but while they were busy fighting over the nuances, I ate them all. Honestly, I loved them all, too. Your post struck me with nostalgia. Now I have to come up with my own *best* deviled egg recipe since I am so far from home. Love the little devils. I have a deal with a friend in that I will buy a dozen or two, boil, peel them and she mixes using miracle whip, little mustard, drop or two of Worcestershire sauce and a sprinkle of celery salt over the top once they are stuffed. Set them out on the table and in 15 min they are gone. I just read this and it made me so happy! I love deviled eggs and yes everyone eats them up! You are currently reading Sympathy for the devil at The Yellow House.